If you cannot find the information you are looking for, please visit our Help Center. How much fabric do I supply if I opt to supply my own fabric? Add your cushion with COM fabric to the cart. Select the cushion in the cart and click the "Show details" link. You will be shown the amount of fabric to send for the cushion, welting, and/or trim. How can I order fabric by the yard or fabric samples? To order fabric samples, click the "Sample" tab on the top menu while viewing the fabric of your choice in our Fabric Selection Tool. From there you will be able to cart your sample. You may also purchase fabrics by the yard by clicking the "Order" button on the top menu. Because of variations from one computer screen to another, it's difficult to precisely match fabric color on our website. We suggest that you purchase fabric samples if color matching is important to your individual buying decision. Select a fabric in the fabric selection tool and click the "Collections" tab. Coordinating fabrics matching the fabric you have selected will be shown. If there is no "Collections" tab, no coordinating fabrics have been selected for this fabric, but there may still be coordinating options available. Contact our customer service department for assistance in coordinating fabrics. Cushion Source primarily uses Sunbrella solution-dyed acrylic fabrics because they are designed for easy maintenance and many years of use. Solution-dying is the process of adding color to acrylic fibers during manufacturing while they are in a liquid state. This characteristic of acrylic fabrics is the key to locking in color, easy cleaning and long life. For this reason, acrylic fabric offers incredible resistance to stains, weather and wear in any application. Furniture grade acrylic fabric carries a five-year warranty against loss of color and strength. How do Sunbrella fabrics lock in color? Do they provide UV protection? Sunbrella fabrics are made from 100 percent solution-dyed acrylic yarns. Solution-dying is the process of adding color to acrylic fibers during manufacturing while they are in a liquid state. This characteristic of Sunbrella fabrics is the key to locking in color, easy cleaning and long life. Sunbrella fabrics have been tested and proven to provide up to 98 percent UV protection from the harmful effects of the sun. Whites and lighter-colored fabrics provide less protection than darker fabrics, which have more depth of color. This protective factor is inherent to the product and will not be reduced by usage and/or fabric exposure to the sun. Why can't I choose a pinched join for my chaise / steamer cushion? Pinched joins are only allowed for chaise and steamer cushions that are less than 4" thick, less than 27" wide, and have squared corners. Instead of a template, can I send drawing with dimensions? No. We require a template in order to guarantee your cushion meets your specifications exactly. While we get a lot of questions on what thickness is typical for different furniture styles, this is a very subjective topic mostly driven by personal taste and preference. For dining and folding chairs, most people typically order a 2" thickness (this is called a "pad" rather than a cushion). How do I order a triangular cushion? Select the trapezoid shaped cushion under seat or bay window cushions and use "0" as the back width. Should I order ties for my cushion? How long are they and where should they be placed? If your cushions will get a lot of use and seating traffic, you may want to consider ties to keep them in place and prevent sliding. Usually the most functional placement of cushion ties is in close proximity to the uprights or corner posts of the furniture on which they are being placed. Our cushion ties are approximately 12 inches long. If you would like your cushion ties to be longer or you wish to specify an alternate location for your ties, you can indicate this in the Order Notes section of your order. Round vs. square cushion corners: Which is best for me? Although this is a somewhat subjective topic driven by personal taste and preference, the primary consideration you should use is the shape of the furniture on which it will be used. For example, classic dining table chairs with sharp, distinctive corners usually are complemented with square corners. Furniture or seating types with more subtle lines and style are more often complemented with rounded corners. This truly is a personal preference, and we can make your custom cushion in either style. Most cushions with round corners have a 4-inch radius, while tufted style cushions have an 8-inch radius on the round corners. I want to order a trapezoid cushion with the back side as the longer side. The diagram shows the front side as the longer side. Enter the dimensions like you want the cushion to be made, even if they are opposite of the diagram. If your back side dimension is longer, the cushion will be made that way. Remember that the zipper will be placed on the back side. Unless you specify otherwise, all of our cushions (excluding tufted style) include zippers, which are tastefully located on the back of your custom cushions. Zippers come in white, black or beige and will be used appropriately with fabrics similar in color. 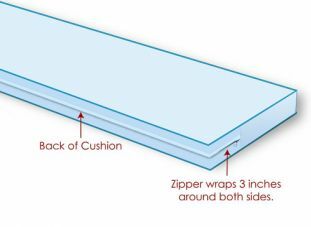 Zippers will wrap 3 inches around each side of your cushion. For Ottoman, Bar Stool, and Daybed cushions ONLY, the zipper is located on the lower seam. You may specify an alternate location for your zipper in the Order Notes section of your order. We highly recommend that you avoid removing the cushion covers simply due to the difficulty involved in replacing the filling, especially in larger cushions. Part of the difficulty in this process involves restoring the evenness of the filling, which may result in lumps and other irregularities. Please Note: Our tufted style cushions, which are tufted with either a dart tack or button, DO NOT include zippers. What types of filling are used in your cushions? For images and details regarding our filling types, please view our Cushion Filler Information page. The price of your custom cushions is determined by two factors: the cost of the materials and the labor required to sew the cushion. The following tips will give you some ideas on how to optimize these factors. We strongly recommend that you carefully consider making changes to your custom cushion to avoid purchasing cushions that you are not entirely pleased with. Select a less expensive fabric. The fabric selection tool allows you to select a price range. We also offer some discounted fabrics. Beware that if your cushion is to be used outdoors, you should use a fabric that is rated for outdoor use. Order your cushion without welting, piping, or trim. If practical, use a standard shape rather than a custom template. Remember, a triangular cushion is a trapezoid with the short side set to 0 inches. A simple triangular shaped cushion does not require a template. If you are ordering a chaise cushion, select pinched break rather than joining piece. The width must be less than 27" and the thickness less than 4" in order to use a pinched break. If you are ordering a chair seat and back, select "Seat & Back (Connected)" with a pinched join type. The thickness must be less than 5". 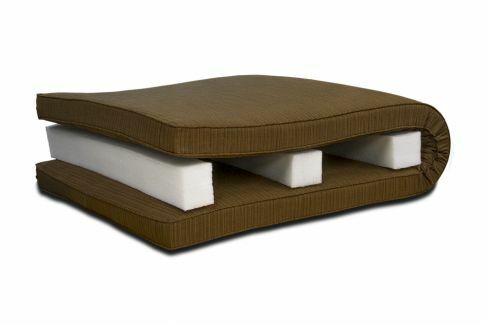 If you have a fairly generic cushion size and shape, look for a Quick-Ship Value Cushion that meets your needs. These cushions have fewer options and fabric selections but offer a lower price than comparable custom cushions. Do your Sunbrella fabrics dry quickly? Can I put them in the dryer? Because Sunbrella fabrics are woven, they are also highly breathable, which is why they dry quickly with only air exposure. It's also important to know that Sunbrella fabrics are treated with a fluorocarbon finish, which enhances water repellency. This finish requires replenishment after vigorous cleaning. Sunbrella fabrics do not absorb water and are designed to air-dry very quickly — usually within a matter of minutes. A clothes dryer is not necessary and will often overheat and shrink the fabric. How often do I need to thoroughly clean the fabric? Can I hose them down? In most environments, a thorough cleaning will be needed every two to three years. Spot clean only. Do not put cushions or shells in the washing machine. One of the best ways to keep outdoor fabrics looking good and delay the need for deep or vigorous cleaning is to hose fabrics off on a monthly basis with clear water. This practice will help prevent dirt from becoming deeply embedded in the fabrics and eliminate the need for more frequent vigorous cleanings. In most environments, a thorough cleaning will be needed every two to three years. Always remember to allow the fabrics to air dry after hosing it down. How can I clean bird droppings off of my cushions? In your cleaning instructions you use the term mild or natural soap. What is mild or natural soap? By "natural soap" we mean Ivory Snow, Dreft or Woolite. These gentle soaps rinse out easily and will not diminish the water-repellent "finish" applied to the fabric. Remember to use cold water and spot clean only, and allow the fabric to air dry. Do not put shell or cushion in washing machine. After several cleanings you will need to re-treat the fabric with a water-repellent product, such as 303® High Tech Fabric Guard™. Is Sunbrella fabric waterproof or mildew proof? Sunbrella fabric is not waterproof, but it is water-repellent. This means that during the finishing process, a water-repellent finish is applied to the fabric. Normal wear and usage will reduce the effectiveness of this finish, as will cleaning the fabric. For more information regarding general care and cleaning, as well as instructions for specific fabric brands, visit our Fabric Care & Cleaning page. Is there a place for me to add special notes to my order? Yes. This is done during checkout. There will be an "Order Notes" text box near the bottom of the page for comments and requests. Use the Order Notes to specify alternate locations for zippers and ties, or to include special delivery instructions. Add the items you desire to your cart. Proceed to checkout and select "Save as Quote." Enter your zip code to also receive a shipping quote. Use your browser's print function if you want to save a copy of the quote. How does expediting an order benefit me? Expediting is a great option for individuals that need to receive their custom items faster than our current lead time. Expediting an order typically cuts lead times in half. Please be aware that production times tend to increase during our "in season" time of the year, which also increases the expedite time accordingly. Some special cases can be met as long as it is within reason. Closer proximity to production facilities can lead to a quicker response time. Contact us with specific inquiries. After completing the checkout process, you will receive a confirmation email at the address you provided. This confirmation will serve as your invoice. This is also to confirm that your order information is correct. If you do not receive the confirmation email after checkout, contact us as soon as possible to confirm your order. If you have any questions or problems, please contact our customer service department. We will be glad to assist you. HELP! I just placed my order, and I need to make a change or cancel my order. If you just placed your order and notice an error on your part, or ours, please let us know IMMEDIATELY by giving us a call or using our contact form, and we can easily correct it for you. If you let us know about an error within one business day of your order placement, we can correct virtually all problems. Beyond that, we cannot guarantee your changes will not incur extra costs if materials have already been cut for your order. At Cushion Source, we provide a secured checkout with Secure Socket Layering (SSL up to 256 bits) for processing your payments online. Add items to your cart and click Secure Checkout to make your payment using a Visa, MasterCard, Discover, or American Express. You can also use this method to pay using your PayPal account, a personal check or PO (purchase order). Payments using a personal check or purchase order are placed on hold until we receive your check or PO and credit information. Payments will be billed as "OCG LLC" — our parent company name. Due to all orders being custom orders made to your unique specifications, your credit card will be charged within 24 hours of placing your order. Online orders are immediately charged to your credit card/PayPal account. The lead time on my cushion seems long. How long before my cushions will arrive? Your custom items are your own special creation — we make them to order only for you. If you select unique materials for your custom creation, more time may be needed to receive the materials from our supplier. Our production times vary depending on the season. Off season can take as little as a week, while peak season can, in extreme cases, go five weeks or more. Orders can be expedited, but a RUSH fee may apply. Rush is available at our discretion and may not be offered depending on the state of production. You may contact customer service to check on your order, but due to the nature of our business, we may not be able to give an exact date for completion and shipping of your cushions. Yes, we have published some research into external services that provide US-based addresses. The providers are called Freight Forwarders because they will forward your US purchases from a central warehouse located in the US to your international location. These companies provide you with a US-based delivery address, which you can use as your shipping address for online purchases at Cushion Source. If you are a Canadian customer, please visit our Canadian site CushionSource.ca. Products purchased from our Canadian website are made in Canada. How will my cushions be shipped? Your purchase will arrive in carrier-approved high density commercial clear plastic. This packaging protects your purchase from moisture, abrasion, and conforms to the wide variety of cushion and pillow shapes during transport. Long cushions may ship folded. Some orders ship in cardboard boxes. We normally ship via FedEx or UPS Ground. All shipping costs and times are calculated using normal ground delivery. Most orders can be delivered within five business days from the shipping date. Normally, our shipments do not require a signature and are left on your doorstep if you are not available at the time of delivery. Larger orders and products may have to be shipped via LTL truck carrier. Expedited shipping is available and appropriate rates apply. Why will my cushions be shipped in plastic? Cushion Source is proud to be a part of helping the community, as well as the planet. Because of our concerns for the environment, we utilize a shipping method that not only reduces excess garbage, but also provides savings for our customers. Shipping in boxes means paying for wasted space within the box. If everyone used paper instead of plastic, the amount of solid waste would take up 7 times more space in landfills than what is currently used.